NOW PUBLISHED BY CENTERSTREAM/HAL LEONARD !!! One of my chief concerns in this book is to show the stylistic differences between regions of Scotland, and also between periods. Guitars, lutes and citterns have been played in Scotland for almost a thousand years, and have always had a distinctive, contemplative voice. The arrangements in this book unite history with the present. Different areas of Scotland have cultivated different styles. These regional variations are a vital part of Scottish culture, but I fear they are being eroded due to political and economic pressures. In my arrangements, I have tried to reflect the origin of the tunes, with their appropriate ornaments and phrasing. The accompanying mp3 recordings are essential for a deeper understanding of the subtle art of phrasing, which cannot be found on the printed page alone. I have spent many years researching and performing the historical traditional music of Scotland, and I feel that has given me an insight into a Scottish tradition of performing traditional music on plucked, fretted string instruments such as guitar, cittern and lute. I have tried in this book to show that thousand-year tradition for what it is, and to incorporate it into later material, from Gaelic song to traditional airs and dances. My main hope is that this book will raise an awareness amongst guitarists and their audiences of the great heritage the modern guitar can lay claim to, and the unique and distinctive style of Scottish guitar playing. 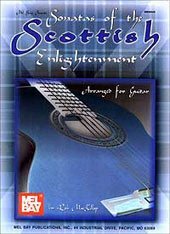 This book (I believe for the first time) attempts to define a uniquely Scottish way of playing the guitar, and it does so not through a dry academic analysis, but through performance – the heart of any musical culture. The book and CD is available from many online sources, just do a Google search for it in a store near you. Such lovely music making! I didn’t know Tighean Geala Sildeag – what a stunningly lovely tune…How beautiful and haunting My Cheeks are Furrowed sounds on the guitar – wish you’d played it two or three times over…I could go on – but anyway you’ve got the drift of my pleasure. Many many thanks. Dr John Purser, author of Scotland’s Music. For beginners to intermediate fingerstyle players. Popular traditional tunes mixed in with some forgotten treasures. DADGAD and OPEN G tunings. Extensive notes on technique, modes, ornamentation. A must for Celtic-style players. For classical guitarists and ambitious steel-string players looking for something a bit different. 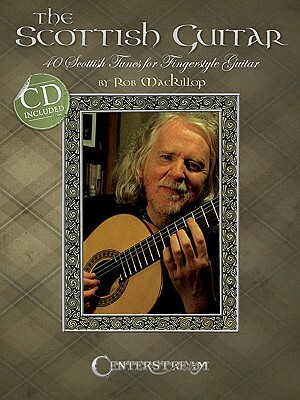 Sonatas Of The Scottish Enlightenment was described in Classical Guitar as ‘Quality Baroque in any man’s language’. Failing that, if you are ever planning a trip to Edinburgh, drop me a line. Moving from the Ukulele blog to this discussion- thank you very much for posting the wonderful Lady Lie Near Me week before last. Not only is it great to compare it to the CD version, and especially the music on the page, but you powerfully illustrate your advice to breathe and let the guitar sing. Hearing your original recordings of these songs on the lute, I thought I would never be able to attempt to play them, but the Centerstream edition and your recordings make it much more approachable. Time for a Skype lesson! Rob, I noticed your tuning on the You Tube of that one is different than the book or the CD as it also is in your CD version of Lady Lothians Lilt, which is capoed at the 3. fret. Possibly, Jeff. I’ve played these pieces on many instruments and in different tunings, often just to see what new light they shine on the tunes. You know, when you shine different coloured lights on an object, and different aspects of it are highlighted? I like doing that. Hi Rob.I am trying to get lute pieces done on a 8 strings guitar,just like the ones you played on you tube.Are those available? I have not done an edition for 8-string guitar, but many of the ones I played in that video are in the first book at the top of this page, but in DADGAD tuning. It has the standard notation (as well as tab) so you could possibly make your own arrangements from that book. When I did the video, I was playing from memory of the original lute tablatures. Hey Rob – starting to get stuck into the Scottish Guitar. I picked up a Waldzither and tuned it GDGBD (most are open C…), so the section on the open G tunes is great. You open it with “wet is the night and cold” and the advice to learn how to sing it, but I cannot find lyrics or recordings anywhere. Any clues? Hi Frank. It’s great that you have the book! I really meant just sing the tune, hum it. I do that with all the pieces. Good luck!